My grandfather brought to this country his personal, wonderful tradition, which was the art of wine-making. And he couldn’t have picked a better part of the world to ply this skill, for he settled in New York State, home to some of the best wine-making grapes in the country. He held nothing back when pursuing this passion, including a trip to the country to buy fresh grapes and carting them back to his basement in town. I remember the elaborate apparatus where he squeezed the juice from the grapes, the fermentation process, and the barrels of red wine that were the result. One time – I must have been eight or nine years old – I was rummaging around his house and coming across a gallon jug into which he had drawn some of his new wine. There was no one around, so I got to wondering how the stuff might taste. Was it sweet? Was it smooth? What was the fascination that adults held for this homemade concoction? So I took off the cap, tilted back, and let the light red fluid pass my lips and touch my awaiting pallet. I distinctly remember my reaction: “How can anybody drink this stuff?” My eight-year-old taste buds revolted at the dry bite. A good wine was something that I just wasn’t capable of appreciating at the time. It is curious that Jesus compared his blood to the fruit of the vine. His blood was shed for us, but to many this idea pure foolishness. Just like wine, one must develop an appreciation for it, and that can only come through age and experience. Rummaging around the attic and stumbling across it is just not enough. It must sink down to our innermost being, and we must savor it sip by sip. Along with the Apostle Paul, I must admit that when I was a child, I spoke as a child, I understood as a child, I thought as a child. But when I became a man I put away the childish things. And I came to a deeper appreciation for the need of a Savior. My tastes were more attuned to the nuances of the blood of Christ. These days a good bottle of wine is part of the enjoyment of life. It took time to develop the taste for it. I would give a lot to go back and sample my grandfather’s creation and experience it with a more appreciative attitude. That opportunity is gone. But the cup from which I now drink is richer than any cup my grandfather could have given me. Here is her YouTube page and her homepage. This is a "Born to Win" mp3. Australia seems to get it. "If those are not your values, if you want a country which has Sharia law or a theocratic state, then Australia is not for you," he said. He continued: "I'd be saying to clerics who are teaching that there are two laws governing people in Australia, one the Australian law and another the Islamic law, that that is false. If you can't agree with parliamentary law, independent courts, democracy, and would prefer Sharia law and have the opportunity to go to another country which practices it, perhaps, then, that's a better option." And there's nothing wrong with that. If you want sharia law, go to Saudi Arabia or Iran or where ever, that's not gonna fly here. At least I hope not. Liz Cheney wrote an article I was pleasently surprised to find: Retreat Isn't an Option. The biggest mistake this country could make right now is pulling out of Iraq. The enemy is drooling with anticipation of our retreat and it will embolden them. Sorry we have to deal with reality here but that's the cold, hard facts. -- We will have to fight these terrorists to the death somewhere, sometime. We can't negotiate with them or "solve" their jihad. If we quit in Iraq now, we must get ready for a harder, longer, more deadly struggle later. -- The terrorists are counting on us to lose our will and retreat under pressure. We're in danger of proving them right. -- A member of Lebanon's parliament recently told me that Lebanese Sunnis, Shiites and Christians are lining up with Iran and Syria to fight against Sunnis, Shiites and Christians who want to stand with America. When I asked him why people were lining up with Iran and Syria, he said, "Because they know Iran and Syria aren't going anyplace. We're not so sure about America." -- America deserves better. It's time for everyone -- Republicans and Democrats -- to stop trying to find ways for America to quit. Victory is the only option. We must have the fortitude and the courage to do what it takes. In the words of Winston Churchill, we must deserve victory. Why do I need a passport to get back into my own country and any Mexican can just walk right in across the southern border? Look long enough on YouTube and you will find some really fantastic clips you never knew existed. Here's one, this is Mississippi John Hurt singing "Lonesome Valley Blues." Not just in Iraq and in our war against radical Islam. We are in trouble in our national soul. We are often undisciplined in the use of our endless freedoms. Those who think a new or better government can change this are mistaken; reforming our morals and our behavior is up to individuals, families, parents, and people in positions of authority such as teachers, coaches, mentors, and role models. We, as a country, need to look in the collective mirror and see the truth: We are becoming what we detest. I agree with that except the last part of the last sentence, "We are becoming what we detest." A good portion of this country appears to enjoy riding this wave in the name of social progress - oblivious, of course, to the destruction toward which we are headed. Some people seem to think that we live in more "liberated" times, when all that has happened is that one set of taboos has been replaced by another and more intolerantly enforced set of taboos. Civil rights used to be about treating everyone the same. But today some people are so used to special treatment that equal treatment is considered to be discrimination. It is hard to think of any word that has confused more issues than the word "rights." Nowadays, almost anything that anybody wants is called a "right" -- a magic word that does away with the need for evidence, logic or even common sense. "Are we better off now with a permanent cease-fire, or when we had bombs, car bombs and explosions?" he asked. "This time next year, we will be better off than we are today." The next morning, a bomb ETA had planted in a Renault van exploded in the five-story parking garage of Madrid's new air terminal, killing two people and causing tens of millions of dollars of damage to Spain's glittery showpiece of modernity. The "Born to Win" program "Gettysburg" is available for download again. Go to this page and you will see the download link for Jan 19. Yvonne De Carlo has died. Hope she's buried with a lily on her chest. What is the rest of the world to do when they come up against the absolute embodiment of evil in a man, a nation, or a movement? This is a must-hear program - 30 minutes and available here for a very limited time before it's replaced. Then, click on the title to listen or right-click and "save link as" to download. Update Jan. 17 - Gone. Here is the Dark Matter map they made. How do they know the gravitational pull they measured to make this map was from Dark Matter and not from the stars and galaxies that are seen? They are saying the Dark Matter attracts "ordinary" matter through its gravitational pull. Why not the other way around? Or why assume Dark Matter at all, why couldn't they have just been measuring the gravitational pull of the "ordinary" matter? I don't know, I'm just wondering. I would like to learn a lot more about this. Anybody Wanna Buy A CD? The music industry now is like the American auto industry was in the 1970's - way out of touch. DISConnect, It's a long article but I think he pretty much nails it. Very interesting, I thought I was the only one so burned out on music. Whatsamadda? I got my eyes closed! Thunk! "We have answered the first question about where the dark matter is, but the ultimate goal will be to determine what it is." 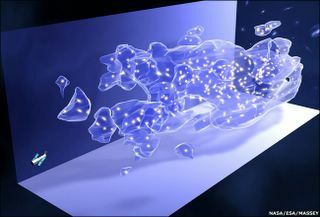 Unlike the ordinary matter of the planets, stars and galaxies, which can be seen through telescopes or detected by scientific instruments, nobody has seen dark matter or knows what it is made of, though calculations suggest that it is at least six times bigger than the rest of the visible universe combined. It's very interesting that it cannot be seen or detected by scientific instruments. Also worth mentioning is the words they chose to describe it. One of the most important discoveries to emerge from the study is that dark matter appears to form an invisible scaffold or skeleton around which the visible universe has formed. Although cosmologists have theorised that this would be the case, the findings are dramatic proof that their calculations are correct and that, without dark matter, the known universe that we can see would not be able to exist. "A filamentary web of dark matter is threaded through the entire universe, and acts as scaffolding within which the ordinary matter - including stars, galaxies and planets - can later be built,"
Scaffolding within which ordinary matter can later be built. Interesting slip of the tongue, I assume, because in no way would they be insinuating that the universe was actually "built" by a higher intelligence, would they? No! I really have no problem with what they are finding, I find it quite fascinating. I love to find out the little details of how the universe was put together. I believe God built it, they don't, but I'm not afraid of anything they can find out about the universe. In fact, every time they make a new discovery - if it turns out to be true - it reconfirms to me that the universe was designed and built by a Being so far above us in intelligence and ability that we can only begin to grasp very rudimentary aspects of that Being, most of which only because He revealed them to us. (Job 26:7) He stretches out the north over the empty place, and He hung the earth on nothing. These were written long before modern science, long before we "discovered" the Earth is not flat. I can't wait to find out more! Tigger is in trouble again. The kind of rules we should have are the kind that we'd make if our worst enemy were in charge. My mother created a mini-version of such a rule. Sometimes she would ask either me or my sister to evenly divide the last piece of cake or pie to share between us. More times than not, an argument ensued about the fairness of the division. Those arguments ended with Mom's rule: Whoever cuts the cake lets the other take the first piece. As if by magic or divine intervention, fairness emerged and arguments ended. No matter who did the cutting, there was an even division. I just had a lady ask me how to get to the airport. She saw a sign that said "Epcot International Airport" and wanted to know where the Orlando International Airport was. I showed her how to get there and explained that the sign meant Epcot and International Airport. Disney doesn't have it's own airport ... yet. I never, ever would have thought to call 911 for that and I can't believe so many responders showed up and treated it so seriously. How many people does it take to clean up a little mercury? It sounds like the infamous light bulb joke. I know mercury is not something you want to play around with - well, maybe you do, I've done it, but that was a long time ago, you shouldn't - but come on. Do you call 911 if you find asbestos in your house? Mercury just sits where it lands if you leave it alone, call a poison hotline and find out how to clean it up and dispose of it. If the stuff is so dangerous, why do they still sell the thermometers? I spent the day painting my laundry room and the night working. It was the busiest New Year we've had in a long time. I posted a new video on YouTube. The video is actually Joshua's doing. He took the camera while we were in New Jersey and took the audience on a tour. Now everyone gets to see it - he didn't expect that!